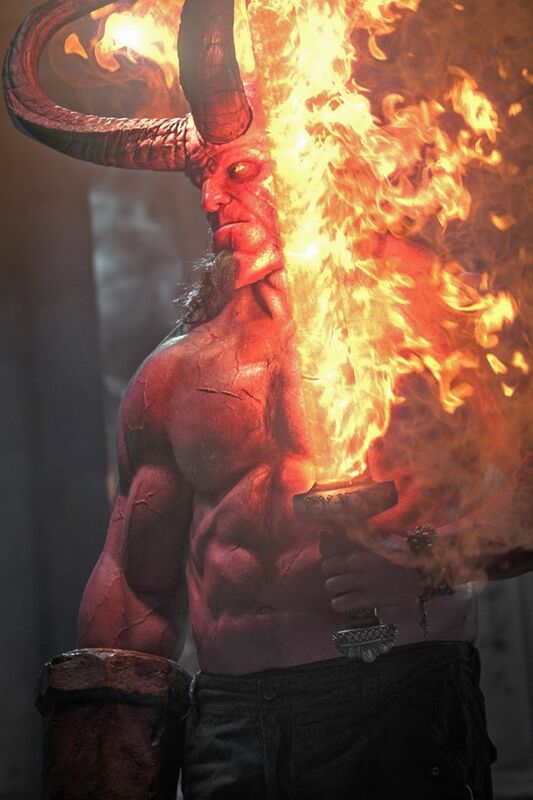 David Harbour stars as Hellboy. What did we do as a society to deserve 2019’s Hellboy remount? Is the film an elaborate punishment, wrought by our inability to combat climate change or self-soothe by receding into the dark echo chambers of hate and instability on social media that only further to divide and enslave us all? These were just some thoughts that ran through my mind during the punishing two hours of this year’s clunkiest and most nonsensical comic-book movie. Watching Hellboy is my new personal idea of hell. You can tell how badly David Harbour wants to find his character behind his thick wall of prosthetics. Made by occasional Game of Thrones director Neil Marshall, who never met a giant monster eyeball he couldn’t gore with a big phallic object, Hellboy is like Deadpool without the irony, originality or star power. It’s like Kevin Smith’s mustiest, oldest flatulence. Andrew Cosby’s screenplay is what I imagine every movie pitched by a fanboy at a comic-book convention would be: sexist, confusing and full of bad puns. The climax of the film sees Hellboy literally ripping a woman’s head off her body, throwing it into a pit and saying, “Hey lady, quit while you’re a head!” I bore witness to this moment and I think it gave me a gigantic cold sore. Hellboy is just not good for the culture, okay? For fans of Mike Mignola’s graphic novels, or Guillermo del Toro’s 2004 original film and ensuing 2008 sequel, Marshall’s addition retreads much of the same territory, but with a flurry of illogical subplots. Trading in del Toro’s visionary steampunk aesthetic for a flaming-skull T-shirt and a middle finger, Hellboy’s incomprehensible plot drags until an inevitable attempt to beg cheaply for a sequel. Also: There’s throat-ripping. Somehow, we learn that Hellboy grew up in a single-parent household (difficult), even though he is a demon born during a Second World War Nazi fight (even worse). 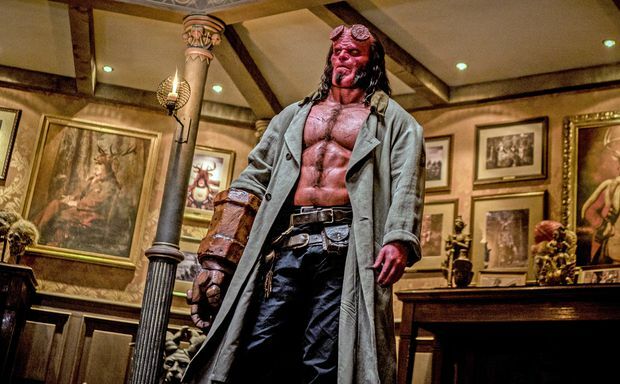 He has a complicated relationship with his father (Ian McShane), who used him as a weapon of mass destruction to fight the creatures of the underworld (please get therapy, Hellboy, you must learn to love yourself). 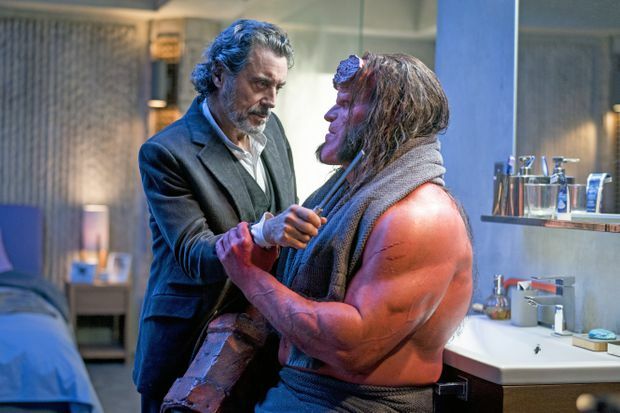 Ian McShane and David Harbour in Hellboy (2019). With a level of tragedy in his life that’s nearly Shakespearean, Hellboy should be a complex anti-hero we want to invest in. Ron Perlman’s incarnation made him seem funny and tragic, a gruff beast waiting to be loved. Instead, new star David Harbour has to deliver awful Two and a Half Men-esque jokes like, “Oh, my Uber’s here” to a Jeep after he groin-kicks three giants into writhing pulp. Are we supposed to believe that Hellboy knows what Uber is? Like, what’s his rating? Two characters from the comics create something of a B-story. Alice (Sasha Lane, hung out to dry by a director who evidently hates her wonderful face) is a young woman who can channel the spirits of the dead, and Daimio (Daniel Dae Kim) is an ex-marine who can shape-shift into a jaguar. Our main villain is the “Blood Queen” Nimue (Milla Jovovich), a sorceress introduced in a prelude getting dismembered by King Arthur himself – she gets all her body parts torn apart and hidden around the planet as part of a tenuous link to The Sword in the Stone that made my heart hurt. Milla Jovovich as Nimue the Blood Queen. Nimue is one of the most passive female villains in recent cinema history, marking the fifth time lately that a female antagonist in a big-budget action movie has been left with nothing to do but pout. These movies, which include Suicide Squad, Tom Cruise’s remount of The Mummy and The Kid Who Would Be King, cast model-pretty women as their vision of death incarnate. The antagonists spend an entire film “gathering their strength” (self-care is important) until they’re easily vanquished in the final battle. This dumb, troubling trope needs to end. Without an effectual villain to fight, Hellboy instead becomes very emo. Del Toro’s films centred on Hellboy’s longing for his love interest, played by Selma Blair. Now, he wants his daddy. The bitter irony in Mignola’s comics is that while Hellboy appears to be a full-blown man, sporting his signature lobster-bisque complexion, shaved-down horns and skullet, he has the emotional maturity of a whiny teenage boy who just discovered Morrissey. You can tell how badly Harbour wants to find his character behind his thick wall of prosthetics. In a few scenes, I saw a tender machismo that reminded me of peak Mickey Rourke. Harbour should be in sensitive Sundance dramedies, not this trash fire. And so, murdering everything from oversized giants sporting big pustules of plantar warts to demented boars with Scottish accents to Baba Yaga herself, Hellboy puns and impales and puns some more. Blood and guts explode from every orifice during these killings (least fave: a woman’s crotch getting ripped apart by two birds made of limbs); the movie trades in gore and unearned F-bombs like the worst Reddit thread you’ve ever read. Hellboy forces audiences to detach and glaze over because it is hateful and lazy and was made by awful filmmakers who probably don’t like movies very much. For anyone who manages to see this movie in the theatre – I’ll see you in hell. Hellboy opens April 12 (you were warned).